Cut the potatoes in equal sized fries. Blanch the fries in boiling water and some salt. Put them on a dry cloth and let them cool down in the fridge. Put the fries into the deep fat fryer at 140C, let them cool down. Bring water to a boil and add the polenta flour, stir well. After 5 min. add the butter, goat cheese, parmesan and Colman’s Wholegrain mustard. Season with salt and pepper to taste. Poor the polenta in a tray. Let it cool down. 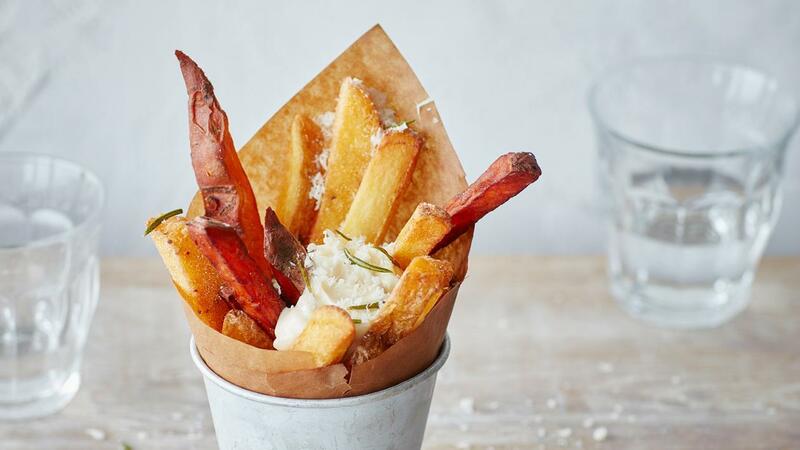 Cut the cold and firm polenta in fries. Dust the polenta fries with polenta flour. When ready to serve cook the potato and polenta fries at 180C until crisp and golden. Serve with Hellmann’s Real Mayonnaise, some crispy rosemary and parmesan cheese.